With issue No.2 we are introducing a new component to our publication: It is called Photo Gallery. With each issue of Advanced Aquarist we will include an especially good photograph of a critter maintained in captivity. Aside from the photograph we will include some information identifying the critter, some husbandry tips, and the equipment and technique used to make the photo. I have provided the first example of this, but in future issues we hope to have our readers submit a prized photo with associated information. For submissions that are published in Advanced Aquarist, the author will receive a $25.00 gift certificate toward a purchase from one of our advertisers chosen by the recipient. Incidentally, the same gift certificate will be given to any Featured Aquarium that is published in Advanced Aquarist. In our Feature this month, Lightingthe Reef Aquarium – Spectrum or Intensity? by Dana Riddle and Miguel Olaizola, the authors go a long way toward answering a question that is at the center of innumerable discussions by reef keepers. Discovering what a given coral’s symbionts (zooxanthallae) require to achieve growth, coloration, and the general health of the coral appears to be only part of the question. Closely related to any given coral’s well-being is the matter of aesthetics. Many reef keepers are as, or more, interested in how their corals look, and how they look is greatly influenced by the color temperature of the illumination devices revealing them to observers. 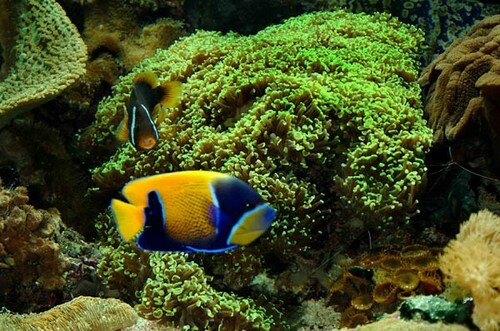 Wanting your corals to look their best to human eyes may only be loosely related to the specific needs of the corals. The authors shed a great deal of light on this complicated subject, but I’m sure their analysis will ultimately raise still more questions. In this issue, J. Charles Delbeek’s Media Review summarizes some of the recent scientific literature that is especially relevant to advanced aquarists. Delbeek co-authored with Julian Sprung what is considered by most the two essential books on reef keeping: The Reef Aquarium, volumes 1 and 2, published by Ricordia Publishing, Inc.
Also, in this issue we are fortunate to have the first in a series of columns entitled “The Coral Whisperer,” by Eric Borneman. Eric has chosen to explore one of the most complex questions facing both coral biologists and reef keepers: coral bleaching, and ultimately diseases of corals, both in the wild and in aquaria. Eric Borneman, in his book Aquarium Corals: Selection, Husbandry, and Natural History, published by Microcosm, in my opinion, brings us the most recent information on coral husbandry, and is a must read for advanced reef keepers. Finally, for those who enjoy cerebral challenges Randy Holmes-Farley, in the “Chemistry and the Aquarium” column tackles the subject of alkalinity, one of the few parameters we all measure, but few really understand fully.